Many shooters would agree that shooting a firearm without a scope or a sight is a disaster waiting to happen. Not only you won’t miss a target several feet away, you also give the target a chance to react and escape. You also give away your location because of the muzzle flash. There are a lot of sights that have been invented, and one type you’d surely like are the red dot sights. With that in mind, we feature the best red dot sights in this article and some pointers on how to choose one for your rifle. How to Choose a Red Dot Sight? Why Do You Want a Red Dot? There are three common types of red dot sights. These are laser, holographic, and reflex types. These said types differ in their design whether they are open or closed/tube and the light source. This type is the most common in red dot sights and mostly used LED light. A reflex sight works by aiming the reticle onto the target through the objective lens, and the light will reflect back to the shooter. 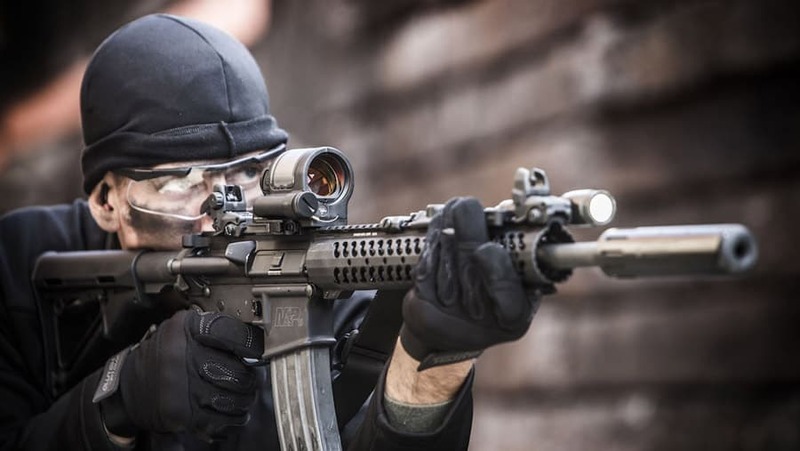 Other than the LED, reflex sight also uses tritium beta lamp that uses ambient light. Reflex sights are commonly in a tube design, similar to a traditional scope. The reticle is illuminated by the laser transmission hologram. The hologram is located inside a glass that forms your window. 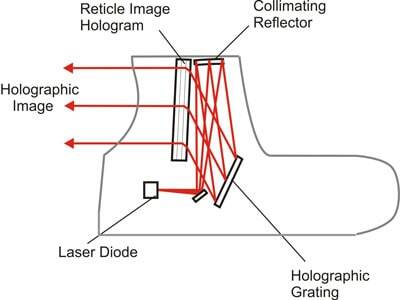 This hologram is made up of laser that is spread throughout the lens and reflects back to you. 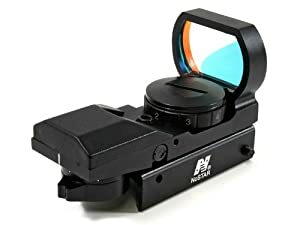 Also known as holo sight, this type normally comes in an open design that is not bulky, unlike tube design. This type is the least commonly used in red dot sights as you need to have clear visibility of the path. As we know, the visibility can be easily affected by the negative weather conditions and also with daylight. A laser sight eats more power than the other types. As mentioned earlier, red dots sights are quite the complex tools, but not as complex as the other sights. There are several things you need to factor in to make your purchase, and we enumerate them here. The dot or the reticle that you are viewing may depend on every sight that you try. They may vary in brightness, size, and shape. The illuminated reticle is from the laser or LED light. In any way, you can mark your target in low light conditions or even if it’s dark. Brightness is a significant factor to consider as you don’t want it too bright that you find it harder to see the surroundings or too dim at daylight. As the magnification is set at 1x for all red dot sights, the brightness of the dot is more important than ever. There are also people that see the color red as too bright, no matter the conditions. That’s why there are also green dot sights available as alternatives. Red dot sights aren’t limited to just dots. There are also patterns like star, bullseye, cross, and rings/donuts. The reticle pattern you intend to have should serve your purpose well. A small dot is best used at further distances, but not with a larger dot. There are red dot sights that have crosshair or grid lines that aid the shooter to target easier. As we know, the crosshair or grid lines have minute for angle measurements that can help you know how far you are from the target. High-end sights have more features for maximum versatility. Most red dot sights are powered by batteries, and the battery life depends on the type. Reflex sights use lesser power because it’s LED, and the battery can last up to 1000 hours. The holographic sights, on the other hand, consumes more energy because of the laser. But newer models no longer have the need for batteries. New power sources like fiber optics and tritium beta lamps are now available. Their usefulness also varies on the illumination. They can be very useful or useless. However, with advancing technology, red dots sights of today can last up to a few years despite continuous usage. The following sights are currently the best that you can find in that market. Applying the several factors to consider in choosing red dot sights, we give you our review of these products. This red dot sight is, in fact, the most expensive sight to be featured on this list. However, you can guarantee that the features are top notch and won’t disappoint you. This red dot sight is a reflex sight type and is commonly used in rifles and shotguns. You have faster target acquisition, maximum target awareness, and unlimited eye relief, thanks to the 2 MOA (Minutes Of Angle). You have the option of reaching up to 70 MOA for elevation and windage adjustment. The MRO provides the shooter with a wide viewing area 44% larger than other red dot sights. The battery used is a CR2032, a lithium battery that can go on for five years even if you don’t turn the red dot sight off. The battery powers up the reticle that has eight brightness or illumination settings. The two bottommost are perfect for night vision. The control knob is quickly accessed because of the 180-degree travel and can be used ambidextrously. 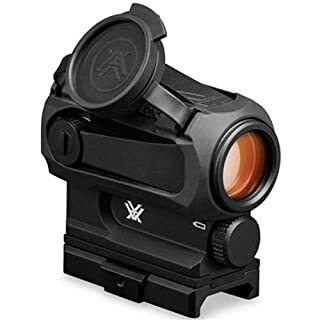 MRO has solid construction as it is made out of hard-anodized and forged 7075-T6 aluminum housing that makes the sight waterproof and assures durability in all conditions. It is shockproof and is 80% stronger than other red dot sights. 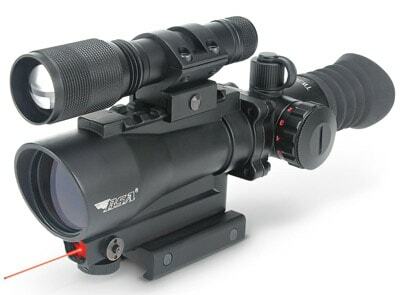 This is a great red dot sight as you can take shooting to the next level. It has a head-up display and not like the other four that are all in tube design. You can easily mount it on any rifle, shotgun, revolver, crossbow, and many others. Using this sight, you can use both eyes, and you have an unlimited, unobstructed field of view that is parallax-free. The heads-up display or also known as open design widens your view and faster target acquisitions. You can quickly identify your targets through 29 mm beam-splitter lens that is hard-coated and scratch-resistant. The maximum adjustment for windage and elevation is 800 MOA. Instead of a control knob to toggle between different brightness settings, Railways uses click switch to do so. There are eight options to choose from, two of them are perfect for night vision settings. The maximum bright setting can make you see even in extremely bright surroundings. As for its battery, this sight uses a lithium battery that can last up to 1500 hours. The external body is made out of aluminum, so it is waterproof and shockproof. 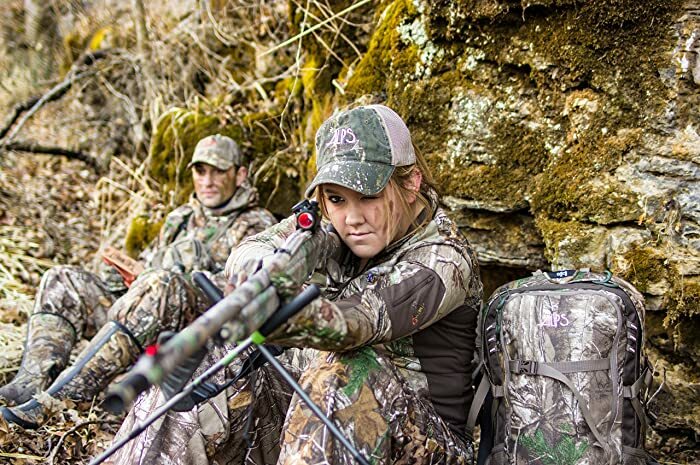 Bushnell has been in the industry for at least fifty years. If there’s one brand that is a powerhouse in sports optics for shooting, adventure or just stargazing, Bushnell is that brand. 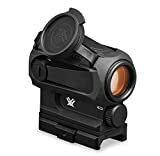 This red dot sight by Bushnell may be the cheapest among the five in this list, but don’t let the low price disappoint you. The features it has aren’t to be underestimated, and you can buy this as your first sight. 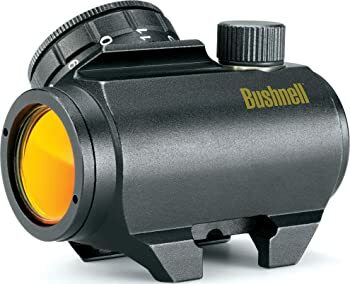 Bushnell Trophy TRS-25 1 x 25mm is engineered with Amber-Bright high contrast optic lens that can distinguish a tree from an animal even if they’re the same color. The optics also aid the shooter for its blazing target acquisition with pinpointed accuracy. The multicoated optics also make you see better in low light conditions. Its main feature is its unlimited eye relief. You can use it without really peeping into the sight and with two eyes wide open. You will have more situational awareness and makes you faster with your target acquisition. The construction of the red dot sight is also made easy with its clamping system and can be mounted on any Weaver style or Picatinny rail. Just don’t overtighten the Allen-style cross screw. This is an example of a reflex sight and uses LED as illumination. It produces a sharp dot reticle, and you can adjust it freely with the control knob. You can make the dot dim or bright depending on the surroundings. The battery used is CR2032. Aside from these features, this red dot sight is waterproof, fog-proof, and shockproof at a low price. This red dot sight have good Performance / Price raito. You will surely get the qualities that you paid for. It is light, and you will easily get the hang of it and use it like any other sights. What makes this different from the other listed sights here is it has an option for a green reticle. At a simple toggle option, you can switch back and forth from red to green, and vice versa. 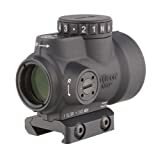 The 4 MOA dot sight makes it possible to acquire targets at fast speed with split-second intervals. The elevation and windage adjustments can be up to 100 MOA. The multicoated optics for this sight reduces the glare of bright light, and you can capture more ambient light. The brightness or intensity level of the reticle can easily be adjusted to your preference. As for the CR2 battery, you can use it continuously up to six hours, and after that, it will automatically shut down. There’s also an optional feature of increasing the magnification twice the normal for more versatility in a screw-in form. Like the Bushnell red dot sight, Strikefire also offers unlimited eye relief. Other details for this red/green dot sight are water resistance, fog-proof, extra high recoil rating, and easy to mount on AR-15 rifles. 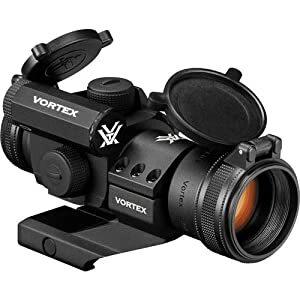 This red dot sight by Vortex has a tagline of point and shoot. As common as with other red dot sights that have the same characteristics, SPARC AR has other features that differentiate it from others and more acclaimed. This sight for AR platform is lightweight, durable, and have the top notch qualities that make it deserving of you. The SPARC AR 1 x 25 mm has an adjustment graduation of 2 MOA for a precise point of aim. As it provides unlimited eye relief and is parallax free, you need not worry about being confused or dizzy. You can change targets at split-second intervals while retaining the accurate target acquisitions. The sight offers ten illumination settings that you can adjust at the rear so you can easily mark no matter what time of the day it is. SPARC AR uses three AAA batteries that automatically shut down after twelve hours after continuous usage. After each shutdown, when you turn it back on, the previously set intensity level is automatically there. It removes the hassle of manually inputting the brightness of the reticle. It has a rugged construction to resist harsh weather conditions and thanks to the dry nitrogen inside; the sight is also made fog-proof and waterproof. Though its use is evident in its name, a red dot sight is quite the complex tool. Aside from the brightness of the sight, you also need to associate the surroundings, the fiber optics, and your skills into the equation. Red dot sights are way better than built-in iron sights as it can reach far distances. Thus, locking onto your target is easier. Red dot sights of the past were big, heavy, and expensive tools. But as technology advanced, they became compact, lightweight, and simple. 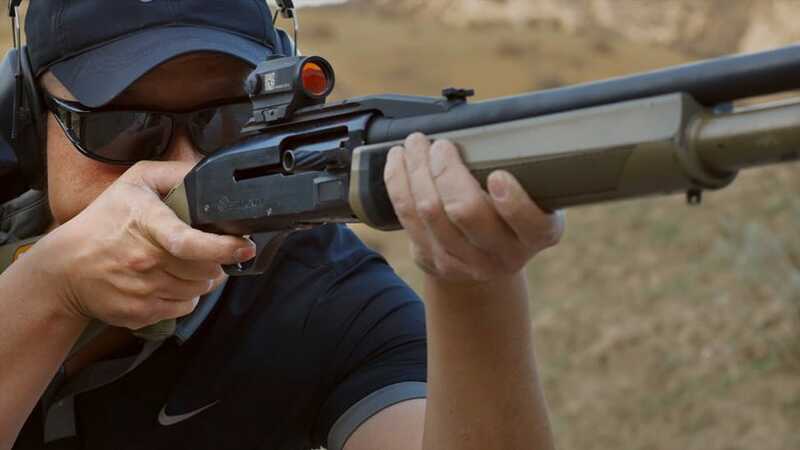 These sights are highly recommended to beginners who are practicing target shooting. Unlike other sights, where you need to consider the angle, elevation, and distance to calculate or estimate, red dot sights allow you to a more enjoyable experience. As simple as you flash the dot on the target, you can immediately fire your gun. You do things way faster and with improved accuracy. Speed is one of the primary reasons why red dot sights are recommended especially in target shooting competitions. 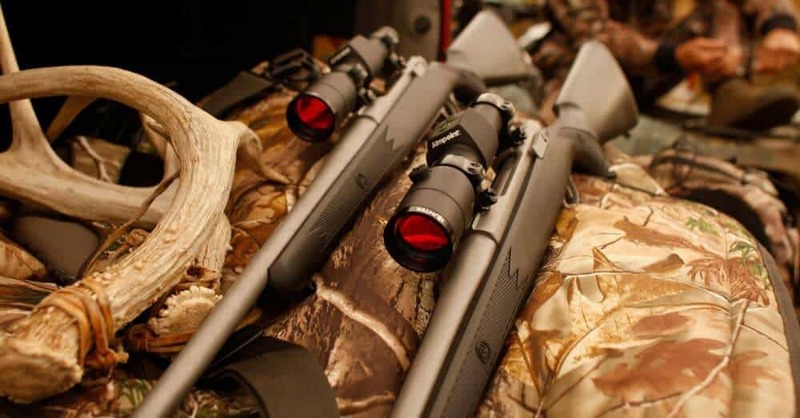 They aid you to acquire the target rapidly than with traditional scopes have magnified optics. Speed is what you need when there are multiple targets and when you need to shoot them simultaneously without breaking the momentum. Another major reason why red dot sights are preferred is that they give the shooters eye relief. 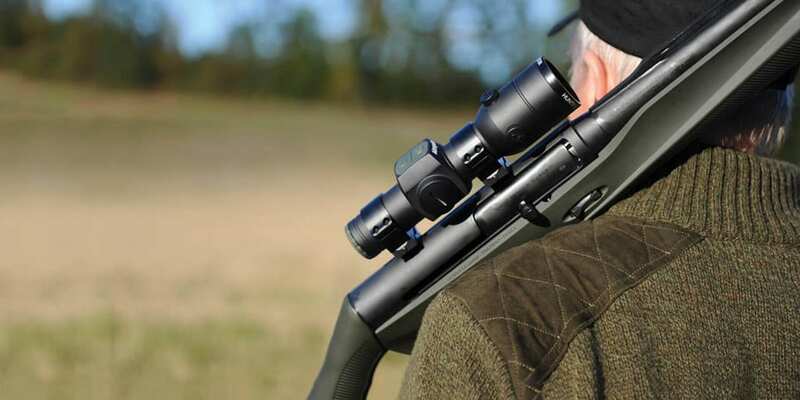 With these non-magnified sights, you will have a wider peripheral vision because you can move the firearm forward without peeping closely into the sight. When the gun fires, there’s an evident recoil. Because the recoil has the possibility of the scope hitting your face by the impact, the red dot sight can lessen that. With the best red dot sights, the way of shooting your prey becomes much easier. You can excel in shooting even if you’re just a beginner because they are simple tools to master. Quality and price are always the deciding factors, in the end, so choose the best red dot sight that you will use without reservations or regrets.